Every summer, in beaches across the Southern California coast, young swimmers aged 9 to 17 come together for five weeks to train, bond, and learn how to save lives. 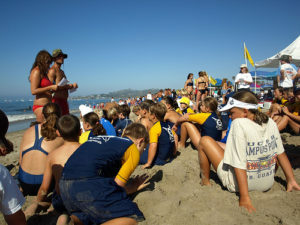 Under the warm but strict guidance of professional lifeguards, junior lifeguards engage in an intense program of open water swimming, beach runs, surfing, and lessons in ocean safety, rescue techniques, and CPR. 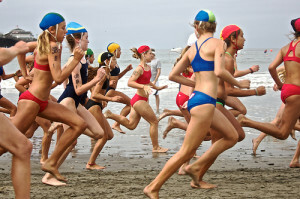 In keeping with its reputation as a standout lifeguard service employing nearly 800 guards, the Los Angeles County lifeguards run an extensive junior summer program and training for cadets seeking to enter the profession. 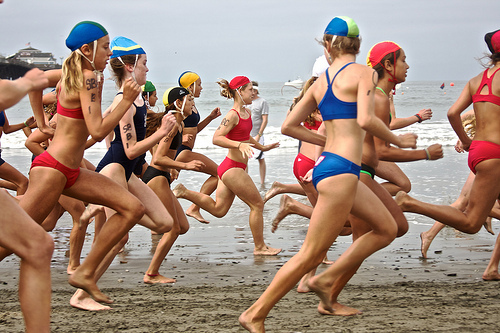 Growing up on the westside of Los Angeles, my kids have always been aware of the junior guard (JG) program, and many of their friends who are competitive swimmers have taken part in it year after year. 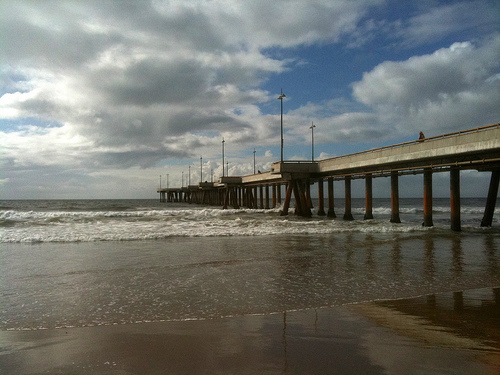 Surfing in the summers, we often saw the young athletes on the beach and in the water, or jumping off the Venice pier as part of their training. Given that my kids are avid surfers, ocean safety is a perennial concern, and I had always wanted them to take part in the program. We’ve only had one instance when we had to be rescued, but the memory of the lifeguard calmly fishing my son out of a rip tide left a lasting impression. This past summer was the first we spent almost entirely in Los Angeles, and the first opportunity to actually try out for the program. Initially reluctant, my daughter wrinkled her nose at the thought of spending the whole summer training. Eventually she was convinced to try out by a close friend who is a veteran JG. With just over a month to prepare, my daughter trained to get her swim time down to the qualifying time for her age group, 100 yards in 1:30. Most aspiring high-school aged JGs train for months or are competitive swimmers, so we were pushing the boundaries of the possible. Driving up to the swim trials at our local public pool was our first true exposure to JG culture. Hundreds of clean-cut swimmers and their parents were stretching, camping on the grass, and queuing up for the swim trials. The adult guards ran the operation with military precision, some in cleanly pressed uniforms, barking out directives and encouraging the swimmers to give it their all. After one failed attempt and a bit of coaching, my daughter made the qualifying time with a few seconds to spare. Flooded with relief, she collapsed, legs shaking, on a bench while I managed to grab the last available spot for the Venice JGs. After we registered, we browsed through the extensive stock of JG merchandise available for purchase: T-shirts, backpacks, pins, swim gear, beanies, sweatshirts and more. Being a JG is an earned badge of pride, and we stocked up on a few choice items like all of the other families at the tryouts. The summer in the JGs turned out to be the best she has ever had, a truly connected learning experience that united her passion for surfing and beach culture with caring adults, awesome peers, and a driving sense of purpose. Despite her love of recreational sports like surfing and skiing, my daughter never really took to competitive sports or hard training. I could not have imagined that she would wake up in the mornings looking forward to long ocean swims and running on the sand with sore ankles, or that she would have ever stepped up to compete in a one-mile run to try out for the regional JG competition. Every evening over dinner she shared her experiences– diving down into murky water with eyes open, jumping off the pier, helping a younger JG through an open water swim, or listening to war stories that her coaches shared of their daring rescues. The LA County JG program is built around the professional practice of lifeguarding and the compelling shared purpose of saving lives and protecting the public. When young people are given the opportunity to connect to this kind of real-world practice and purpose, in the context of a well-designed program, they gain superpowers. My daughter emerged from her summer lean and muscular, with new friendships and mentors, and a drive to contribute to the public life, culture and health of her local beaches and environment. The post-JG transition back to sequestered classroom and book learning has been tough this fall, but she is consoled by surf sessions with JG buddies, and our exploration of community service opportunities related to beach culture. Sadly, no LA County JG programming extends beyond the summer months, so it has been up to us to connect the summer learning to other activities during the school year. While I doubt professional lifeguarding is in the cards for either of my children, the opportunity to experience first-hand what it means to dedicate oneself to public service is a memory that I know has made an indelible impression, much like witnessing a lifeguard rescuing a little one on a windswept morning at Venice beach.